Behrooz Makki was born in Tehran, Iran. Among more than 500,000 participants, Behrooz was ranked 31st in the University Entrance Exam for Undergraduate Studies, Iran, 1999. He received the B.Sc. degree in Electrical Engineering from Sharif University of Technology, Tehran, Iran, and the M.Sc. degree in Bioelectric Engineering from Amirkabir University of Technology, Tehran, Iran, respectively. Behrooz received his PhD degree in Communication Engineering from Chalmers University of Technology, Gothenburg, Sweden. Since 2013, he is working as a Postdoc at Chalmers University. 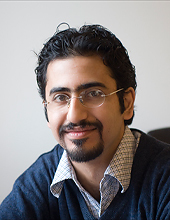 Behrooz is the recipient of VR Research Link grant, Sweden, 2014, and the Ericsson's Research grant, Sweden, 2013 and 2014. His current research interests include partial channel state information (CSI) feedback, hybrid automatic repeat request, Green communication, correlated fading channels, spectrum sharing, relay, satellite and CoMP networks. There might be more projects where Behrooz Makki participates, but you have to be logged in as a Chalmers employee to see them.